David Woolsen & Paul Gregutt of DavePaul5 entices the crowd with their mix of rock, blues, country classics, originals and more. Sound and Stone's Nico & Bash Evans "are influenced by all music and especially blues, 70s folk, flamenco, Irish folk, throat singing, Rishi, and chanting. The blend of all these different sounds, married with their organic ability to express, has proven over and over again to move the audience and reach out and touch each person." Julie Perron is a local singer-songwriter with roots in California and the Pacific Northwest. Inspired by artists such as Jackson Browne, Joan Baez, Taj Mahal and Linda Rodstadt, her influences are diverse. 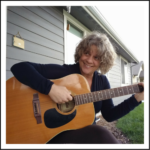 She has been featured in music festivals, and played various clubs, but her best memories are coffee house scene while attending UCSB and the local cafes in Salamanca, Spain. When not playing solo, she is part of her band, Concrete Angel, a group of musicians that include her cousin and uncle.